With the most epic sports weekend finally in the record books, the sports fans finally can sit down and debate amongst others on how everything played out. Source Sports own Omari White has decided to give his 2 cents on how everything played out. 6 years in the making, the dream bout finally went down at the biggest stage of them all. 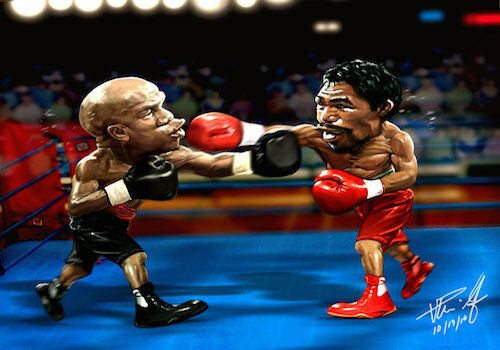 Proclaimed as the “fight of the century”, many sources believed that this bout was going to spark the resurgence of boxing. Too bad, there were a lot of disappointed fans in the arena as well as the 67% of people who believed Manny Pacquaio would emerge victorious and paid $100 dollars to PPV only to see their prediction fall flat. Pac-Man only landed 19% of his punches. Talk about swinging for the fences. Technical boxing was on hand as Money Mayweather proves to the world that at age 38, he can still move as fast as ever while his overall net worth increased by 36% by the nights end.